Renaissance wax is one of the most versatile products we have used and only our fantasy and imagination limits its use. One of the most common questions we are asked is can Renaissance wax be used on teak and mahogany garden furniture? The short answer is a most definite yes. 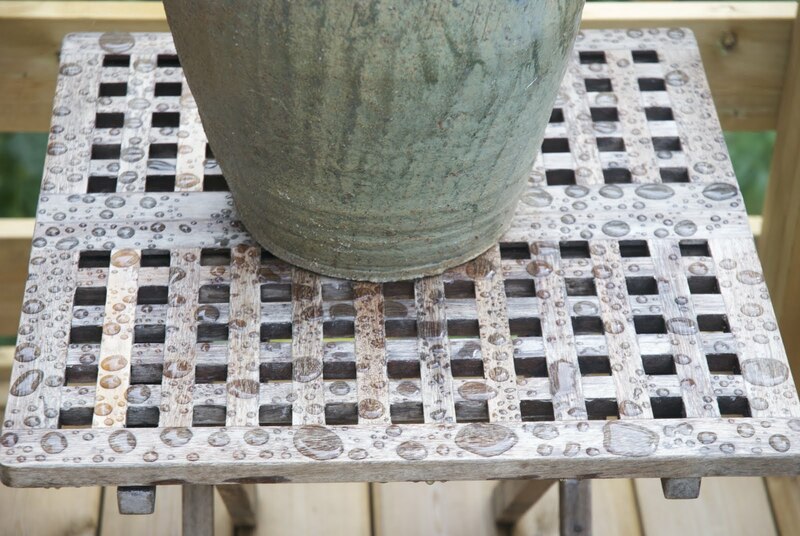 When you use teak oil or other furniture oil, the oil layer is thick – known technically as a thick film layer. Most people believe that the more oil you put on the better the protection. This could not be farther from the truth. When the oil film is thick, only the outer layer dries leaving the inner layer as a thick sticky liquid. When you sit or use the furniture, this thick sticky liquid moves under pressure and stress and can cause the outer skin to rupture. Apart from a sticky oozy mess, the protective coating is no longer intact thus allowing moisture to enter into the grain of the wood. Worse still, the thick sticky liquid attracts dust which in turn attracts moisture and the oil no longer gives protection. Most hardwoods are naturally acidic, so it is important to make sure that the substance used to protect these surfaces does not contain acid. Acid has a deleterious effect on most materials, so the wax used to protect may very well attack the item you are trying to preserve. Renaissance wax is a pH neutral wax so it is safe to use on almost all surfaces. Its micro crystalline structure repelled the water or moisture because the space between its molecules is smaller than the water molecule thus preventing the passage of water and moisture through the wax layer into the grain of the wood. 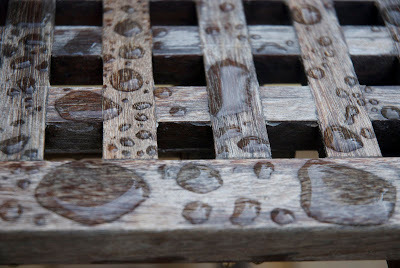 The photographs show a mahogany table that was caught by a passing summer shower of rain. The water does not lie flat but is very curved almost into a ball like shape. This clearly shows the wax in action and a closer examination shows that the wood has not soaked any moisture. 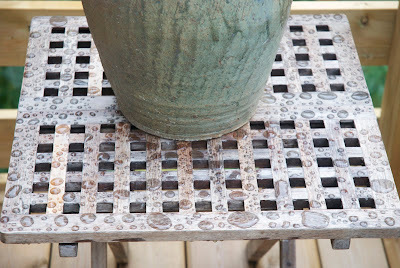 This table had only been treated with two very thin layers of Renaissance wax. Because the layers were thin, the wax dried hard all the way through the film. However we would recommend at least six layers of wax to ensure the wood is completely covered and to allow for the usual wear and tear that external furniture will receive. Renaissance wax can be used on a diverse range of surfaces from paper, wood, leather. brass, copper, steel wrought iron and many more materials too numerous to mention. 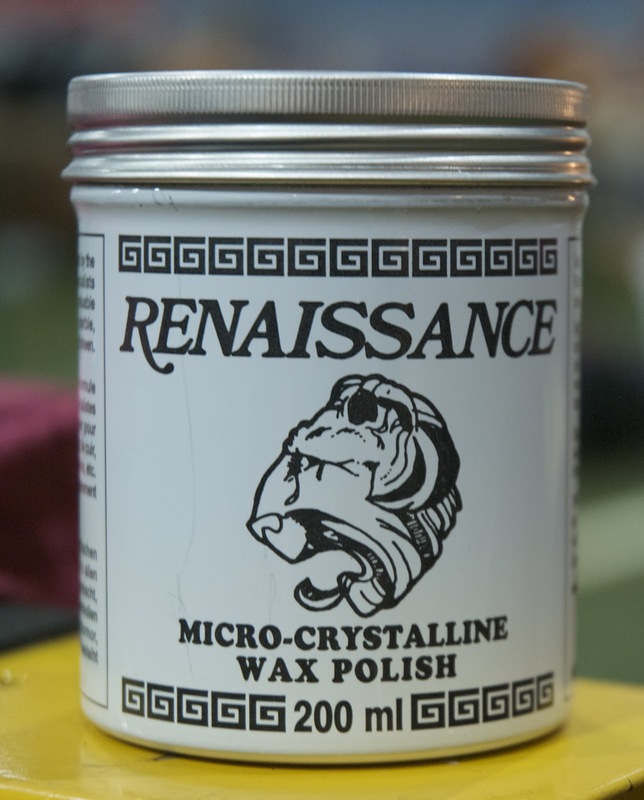 Originally developed by the British Museum, Renaissance wax is the professional restorers first choice. Whilst you may not be a professional restorer, you can still benefit from using the worlds best wax. We would be interested to know about any unusual application for Renaissance wax.